Another swift visit after a conference in London. Much the same as the last time I was here. Gareth and I sat by the brewing kit. An evening visit for dinner- table for seven to wish well to a couple of friends heading off to the Caribbean for a while to watch cricket. Brewhouse and Kitchen (Islington) - Arc Angel 3.60 A nice, traditional, brown Bitter. Brewhouse and Kitchen (Islington) - Hotblack Desiato 4.00 A smooth, slightly sweet Oatmeal Stout. Hints of coconut. 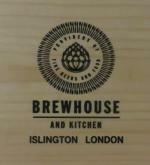 Brewhouse and Kitchen (Islington) - Vlad 6.00 From keg dispense. A Black IPA, smooth and hoppy. Late morning and quiet. Thankfully two of the lines were neing cleaned so I could not be tempted with a 6% beer before lunch. We arrived early for our 1700 Beer Masterclass appointment, the host was delayed so we were offered a Chaplin to pass the time. Very enjoyable session with our knowledgeable Czech host. I have not listed all the beers sampled, including a few bottled and keg dispense. Beavertown - Gamma Ray 5.40 Keg taster, light dry refreshing mango peach and passion fruit flavours. Brewhouse and Kitchen (Islington) - Chaplin 6.00 Hoppy bite with a toffee caramel aftertaste. Brewhouse and Kitchen (Islington) - Spandau B 4.50 Bready yeasty and malty with a banana aftertaste yet served crystal clear in superb condition. Brewhouse and Kitchen (Islington) - Arc Angel 3.60 Copper coloured session bitter with a fruity prune aroma and biscuit flavour. Thursday evening and absolutely rammed, although thinning out a little after 8:30. Brewhouse and Kitchen (Islington) - Britton 5.00 Described as an ‘American Brown Ale’ – it is certainly a decent enough Brown Ale but I’m not sure it has the hop presence to add the word American. Brewhouse and Kitchen (Islington) - Spandau B 4.00 Some pleasant hop flavours. Brewhouse and Kitchen (Islington) - Myddleton 3.60 A sweetish Blonde beer with a soft mouthfeel. In flat condition. Busy from 6pm. Whilst we were here a young lady spectacularly and noisily fell off her stool, bringing down a whole table of drinks with her. She got up none the worse for the experience. Brewhouse and Kitchen (Islington) - Chaplin 6.00 Pale, strong and fruity/hoppy in a US way. Brewhouse and Kitchen (Islington) - Vlad Winter Warmer 5.00 Dark, sweet and flat. Lunchtime - pleasantly busy - reward for over 40 hours babysitting granddaughters. Brewhouse and Kitchen (Islington) - Spandau B 4.00 Rather cloudy. Brewhouse and Kitchen (Islington) - Chaplin 6.00 Also on the hazy side. Number 6 on our crawl, mid to late afternoon fairly busy and pleasant aromas wafting around from the brewery. Lunchtime visit, and a nice lunch eaten. Pub quiet. First stop on an afternoon pub-crawl of the area. Brewhouse and Kitchen (Islington) - Watchmaker 5.50 A brown, fruity, Best Bitter. Lunchtime with the family - very pleasant - not too busy - bank holiday weekends are generally a good time to go to London. Brewhouse and Kitchen (Islington) - Myddleton 3.60 First class condition and crisp, hoppy flavour. Brewhouse and Kitchen (Islington) - White Chocolate Stout 5.00 Remarkable - an amber colour with the distinct flavour of expensive chocolate. A very good food accompaniment. The pub is found in Islington, Central London, EC1V 1NG. This pub was present by 1838 as the Blue Coat Boy, which, by the 1980s, was part of the Allied Breweries’ empire. It was demolished in around 1991 and a new, spacious replacement built at the foot of a new development around Angel tube station. The pub has since been through a number of names and themes, including as the Blue Angel. Relaunched in October 2014 as the Brewhouse and Kitchen, it is part of a chain of brewpubs of that name – the others being in Bristol, Dorchester, Portsmouth and London's Highbury. 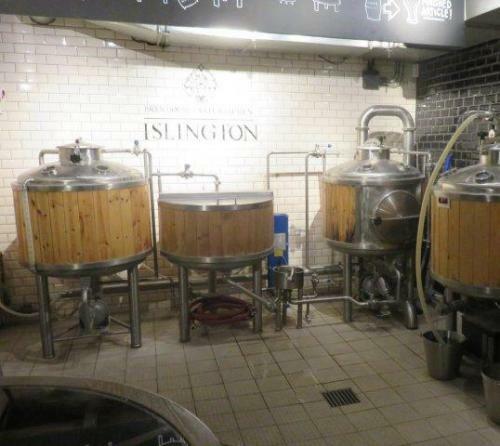 The brewery equipment here was previously in use at the short-lived Botanist Brewery in Kew. 8 handpumps. We have visited this pub 24 times, seen 17 different beers and tried 14 of them.